Isma is free. After years spent raising her twin siblings in the wake of their mother’s death, she is finally studying in America, resuming a dream long deferred. But she can’t stop worrying about Aneeka, her beautiful, headstrong sister back in London - or their brother, Parvaiz, who’s disappeared in pursuit of his own dream: to prove himself to the dark legacy of the jihadist father he never knew. Then Eamonn enters the sisters' lives. Handsome and privileged, he inhabits a London worlds away from theirs. As the son of a powerful British Muslim politician, Eamonn has his own birthright to live up to - or defy. Is he to be a chance at love? The means of Parvaiz’s salvation? Imagine living in a world where every act you undertake is politicised, against your will. For some readers, this will be a reality. Kamila Shamsie’s latest novel, Home Fire, depicts this very phenomenon. It tells the story of the Pasha family: Muslim Brits living in the shadow of their father’s terrorism, and the politics of the powerful people who treat them with hostility and contempt. Twins Paravis and Aneeka were small children when their father died on his way to Guantanamo Bay, and were just 12 years old when their mother and grandmother died within a month of each other. Isma, their elder sister, was forced to put a budding career in academia aside to care for her siblings. This is a family unit that is cohesive and loving, but underpinned with great pain. As the novel begins, Isma has left the UK to recommence her PhD in America. Aneeka is studing to become a lawyer, and Paravis is working at a greengrocer’s, figuring out a way to follow his passion for audio engineering, while still fulfilling Isma’s desire for him to be able to support himself. In a coffee shop in Massachusetts, Isma meets Eamonn Lone. Eamonn is the son of Karamat Lone: the UK’s current home secretary, the son of Pakistani immigrants, known for his harsh stance towards Islamic immigrants to the UK. After being shown a photograph of Aneeka, Eamonn falls hopelessly in love with her. Upon his return to the UK, he begins to pursue her, and the lives of these two families become dangerously intertwined. 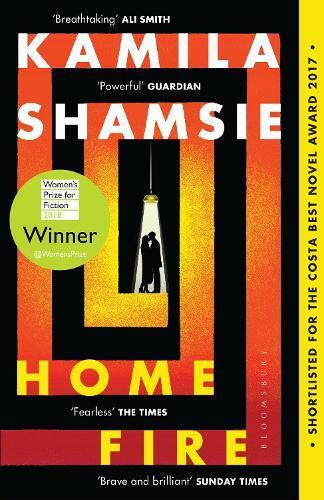 It’s hard to recount the plot of this novel without giving too much away – Shamsie has structured it masterfully. For lack of a better word, this book made me ache, and I felt every sentence of it keenly.